The ACPBC congratulates Lavraj Lidher of Thompson Rivers University as the 2017 ACPBC Undergraduate Student Scholarship winner. Lavraj is a 4th year student in an honors program in Chemical Biology. He has volunteered extensively in chemistry outreach activities including the Eureka summer camp program, and the TRU Family Night of Science. Read more here. Ever wondered about the chemistry of all the great tastes, smells, and sparkle of Christmas? Then check out the 2017 Advent Calendar at COMPOUND iNTEREST. Andy Brunning, a chemistry educator based in Cambridge UK, posts easy-to-read chemistry infographics. December 1, 2017 was on the flavours of chocolate, December 2 on the odor of Christmas trees, … you get the point. 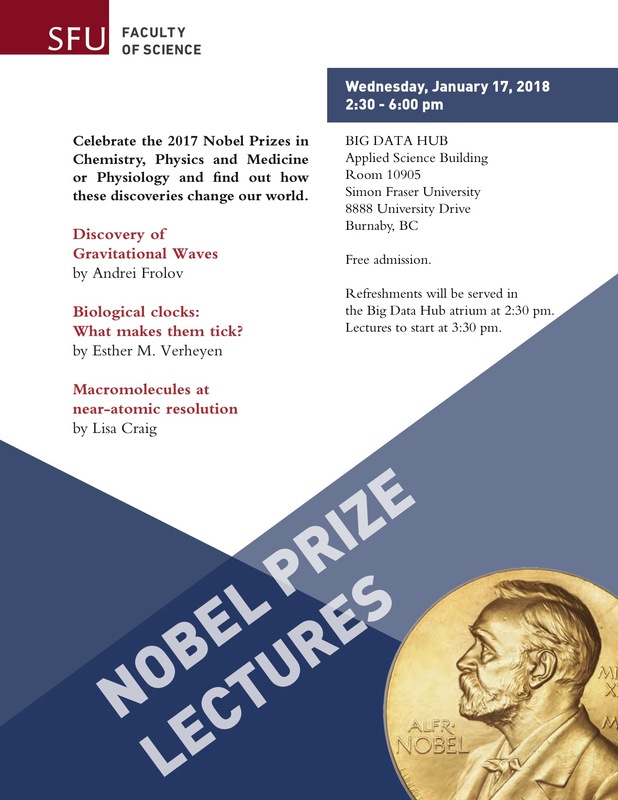 UBC chemist Prof. Chris Orvig P.Chem. recently illustrated how “normal science” works – by publishing a correction to earlier work from his group. In 2002, Orvig and co-workers reported a new compound that appeared to contain four N and two P atoms in a cyclic structure. Returning to the same compound a decade later, they were able to form crystals of the compound, only to discover that was only half what they had previously reported – two N and one P in a cyclic structure half the size. Vancouver Island Univers1ty professors and Professional Chemists Chris Gill and Erik Krogh have unveiled their new mobile mass spectrometry lab. The Mercedes transit van houses two mass spectrometers plus several other atmospheric monitoring instruments, and can provide real time-real space data on chemical concentrations in the environment. This can be used to track the spread of a spill or the release of gases into the environment using on-board GPS to map the substances and their concentrations as the lab drives around. More details from VIU and local media. Plan to attend the Annual General Meeting and Pre-AGM conference October 20th. Chemistry is continually evolving and there are many new programs and career paths in parallel to traditional chemistry programs. The goal of this session is to examine how we recognize a “chemist” as meeting and maintaining the requirements for registration. How does our thinking on professional registration of chemists need to evolve to keep pace with the demands for modern interdisciplinary approaches to professional advice to governments on behalf of the public? The new provincial government has called on the Minister of Environment to conduct a review of professional reliance and its role in government decision-making. The goal of the session is to examine how we should respond to government, and to society in general, on the value of professionals in the protection of the public interest. What regulatory mechanisms need to be in place so that the expertise of our members has credibility? How should our organization evolve to address the concerns of fellow citizens about our internal processes? The AGM is open to all ACPBC members and will include: the business of electing the Directors and Officers; the audited financial statements for 2016 – 2017; ratification of the Audit committee for 2017 – 2018; announcement of membership for the Nominating, Membership and Registration, Professional Affairs, and Discipline committees; and the report of the Board of Directors. If you are unable to attend the AGM or the pre-AGM discussion in person you will be able to participate via a web conference. Contact the Registrar (registrar(at)pchembc.ca). The application deadline is October 27, 2017. The award will be announced by the end of November. The conference will be held September 28, 2017 in the Segal Building, Room 1200 – 1500, 500 Granville Street, Vancouver, BC. As in previous years, a Technical Workshop will be held on the previous day September 27, 2017. This year’s topic is Innovative Methods in Site Characterization. The program includes 9 speakers from across Canada and the US including two presentations from the BC Ministry of Environment. Registration and full conference and workshop programs are available in the SABCS website. Registration can be accessed directly at the following URL. Check out new lower rates for the workshop and lower fee for new professionals in the contaminated sites area. Includes hot breakfast, buffet lunch, delegates list and of course, provides presentations on a USB drive for the days you attend. Check out this Periodic Table! A haiku for every one of the 118 know elements (plus one for the next one to be made). The 2017 CMA Conference will be held in Kamloops, BC, between September 10 and 14 at the Coast Hotel & Conference Centre. Workshops include the topics of traceability and method validation. Conference tours include local laboratories and the New Afton underground gold mine. If you are planning to submit a technical paper – act now. The deadline is August 6. Download a submission form. The registration deadline is August 25. Registration forms for the conference are available. Information about the CMA is on-line.